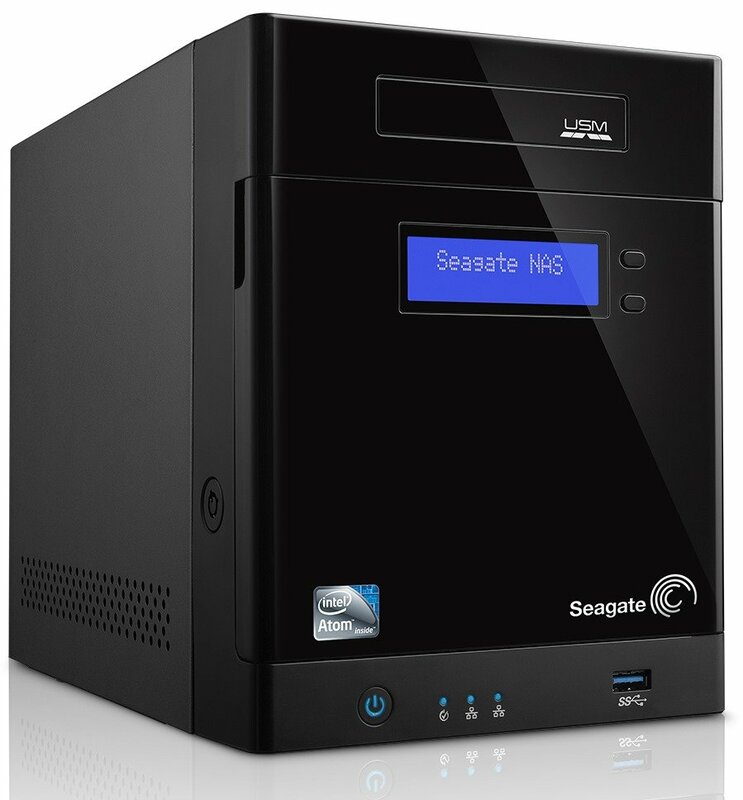 With data protection options, storage capacity flexibility and easy integration into an existing Active Directory domain, the Seagate Business Storage Windows Server 4-Bay NAS comes primarily aimed toward a small business or branch office with up to 50 employees. 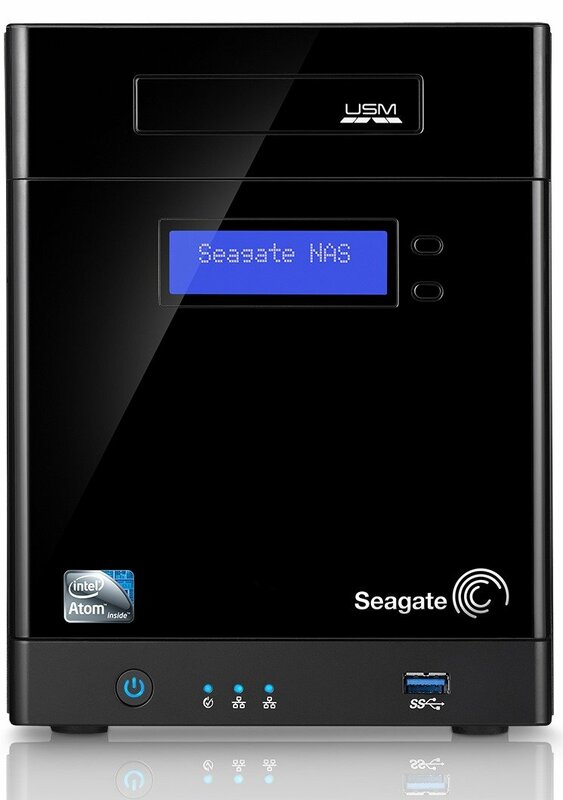 The full name for this server is the Seagate Business Storage Windows Server 4-Bay NAS. As that name doesn’t really roll off the tongue (or keyboard), I will refer to it as the NAS for the rest of the review. 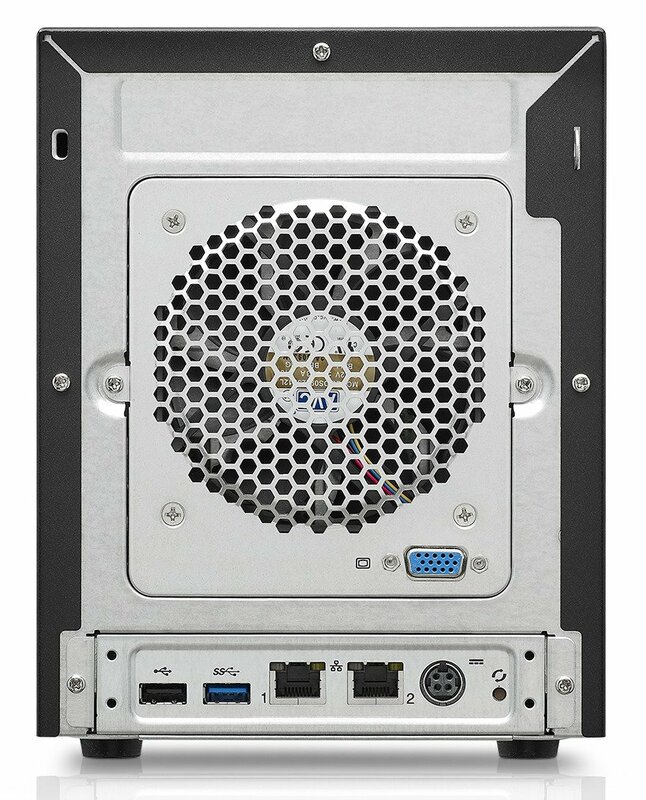 The model supplied for review is the STDM16000100, which is powered by a Dual-core 2.13GHz Intel® 64-bit Atom™ processor D2701, 4GB RAM and has been fully populated with four Seagate ST4000VN00 4TB NAS drives. These disks are specifically designed to work in NAS systems with 1-5 drive bays, offering 24×7 running with improved balance and reduced vibration over standard desktop drives. Measuring 25cm(10’) long, 16cm(6.2’) wide and 20cm(7.8’) high, the NAS is finished if black painted steel with a black plastic front. Unusually, the door contains a 2-line LCD status display that hinges out with the door when its opened to access the four storage bays. The bays are hot-swappable, but the disks do need to be housed in screw-less caddies before being inserted. 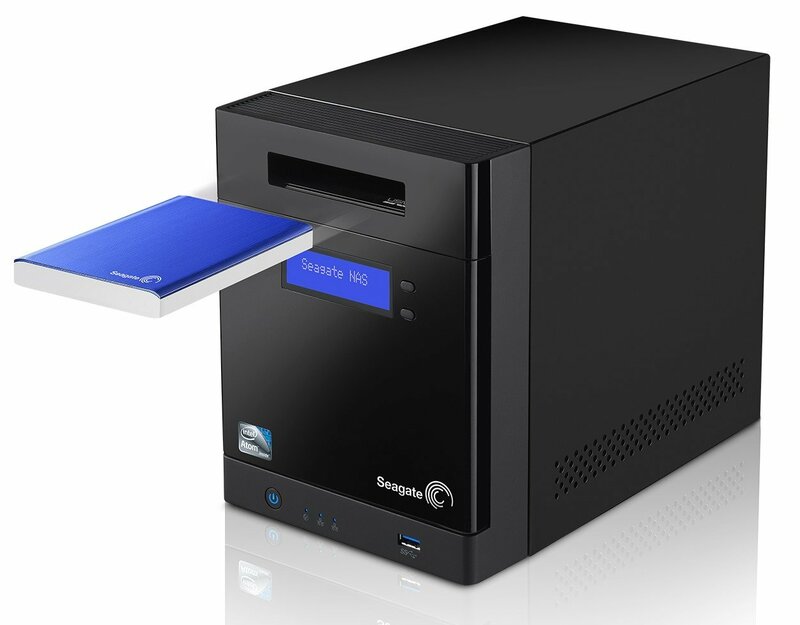 Above the storage door is a Seagate USM slot, which allows the easy insertion of an additional portable hard drive. 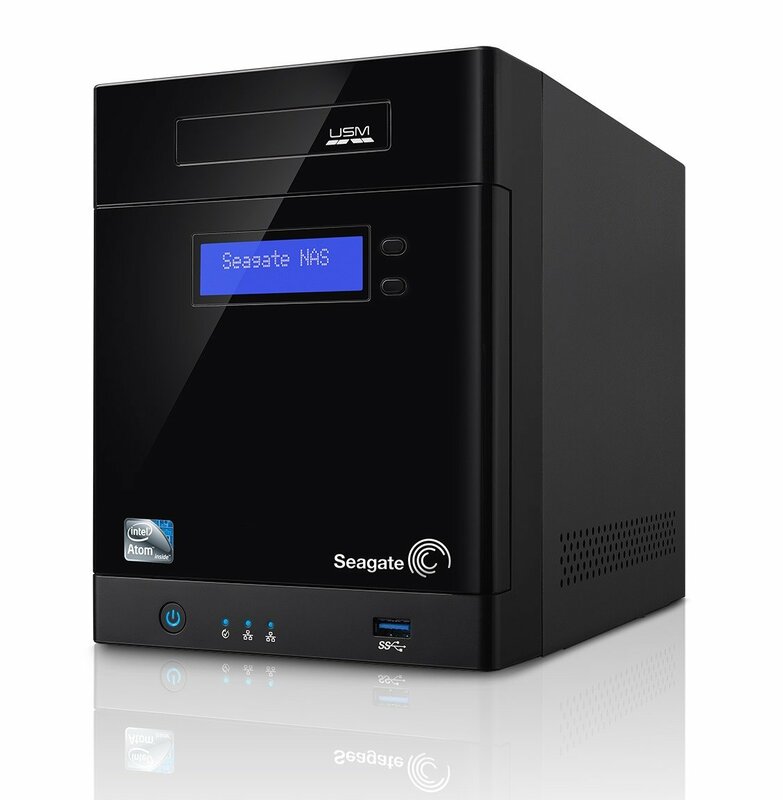 Options for usage of this could include a drive for offsite backups, an encrypted drive with confidential data that could be locked in a safe over night, or for the easy importing/exporting of photos or video from clients. Its unusual to see an option such as this on a server, and its possible uses are quite varied. The remaining items on the front include power and network activity lights, the power switch and a USB 3.0 port. Around the back there are a pair of Gigabit Ethernet ports, USB 2.0 and another USB 3.0 port, power input and a VGA connection. Overall the server feels solid and well constructed, and certainly won’t look out of place in the workplace. Power consumption for the NAS averaged around 40 watts, which is very respectable and although It would have been nice to see a dual power supply capability, this is not a major omission. 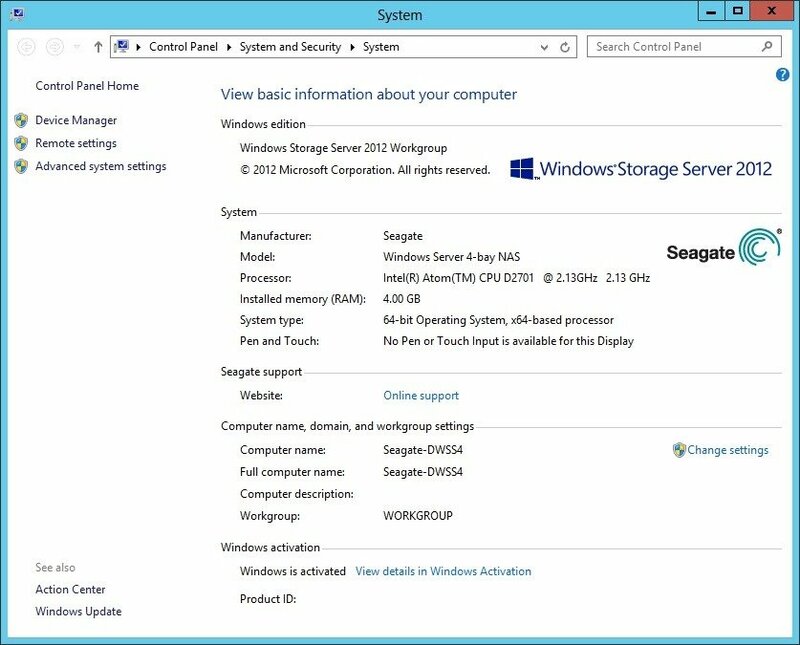 The NAS comes supplied with Windows Storage Server 2012 Workgroup, which is a NAS platform based on Windows Server 2012 and made available to Microsoft’s hardware partners. 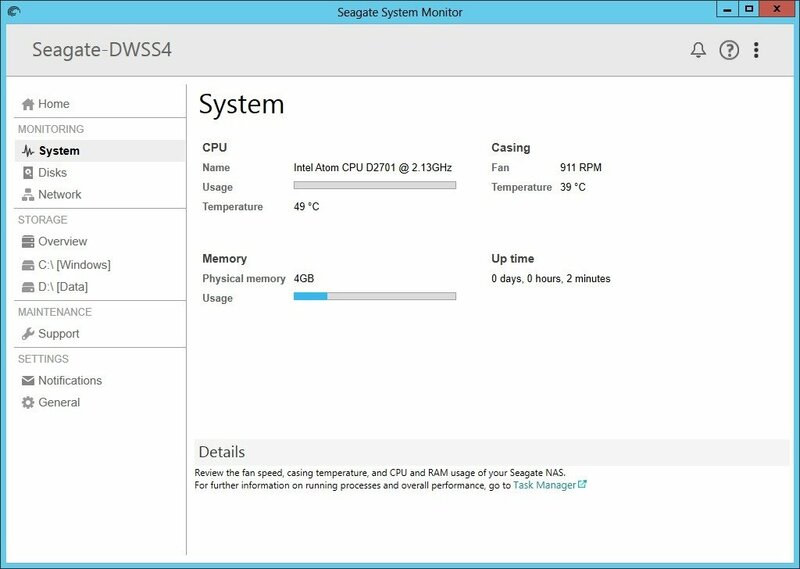 OEM’s can then integrate this version of Windows Server into their own hardware lines. 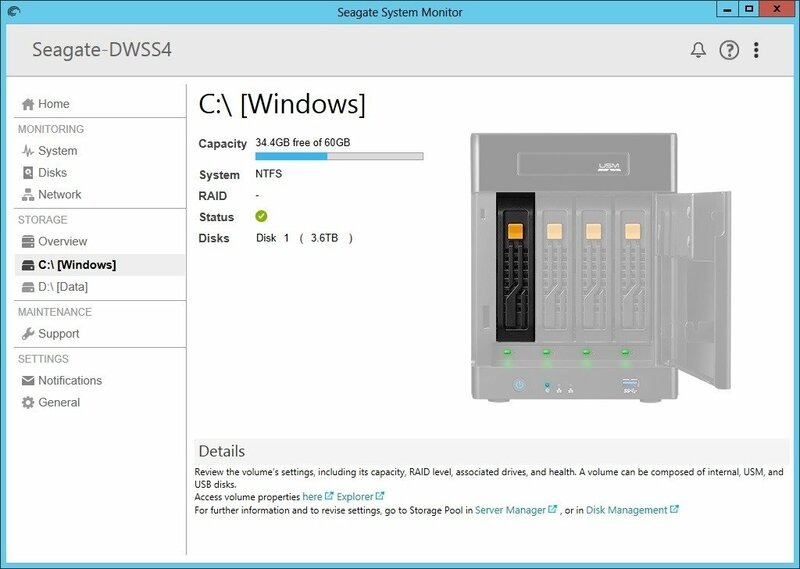 As you can see from this, Windows Storage Server 2012 fits into the lower spec, high user requirements space so is perfect for an OEM to use on a NAS box. 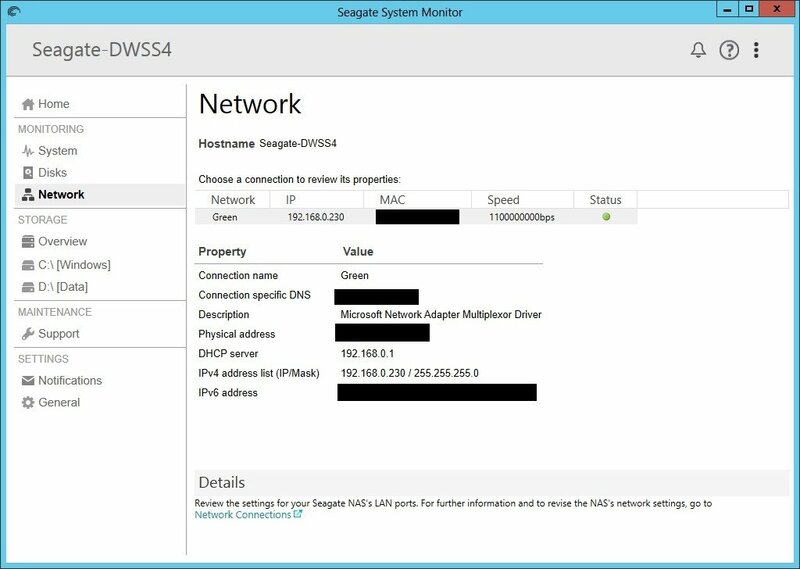 This version of Windows Server has reduced capability compared to other versions, but it does allow the Seagate NAS to join an existing domain. 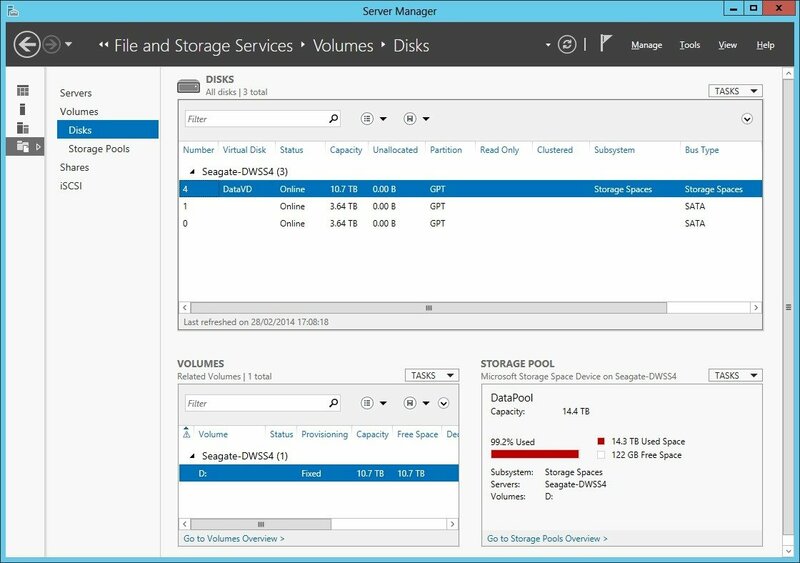 And this ultimately is the point of this server, it provides a quick and simple way of offering a large amount of storage to your existing domain based Windows users. No fuss. 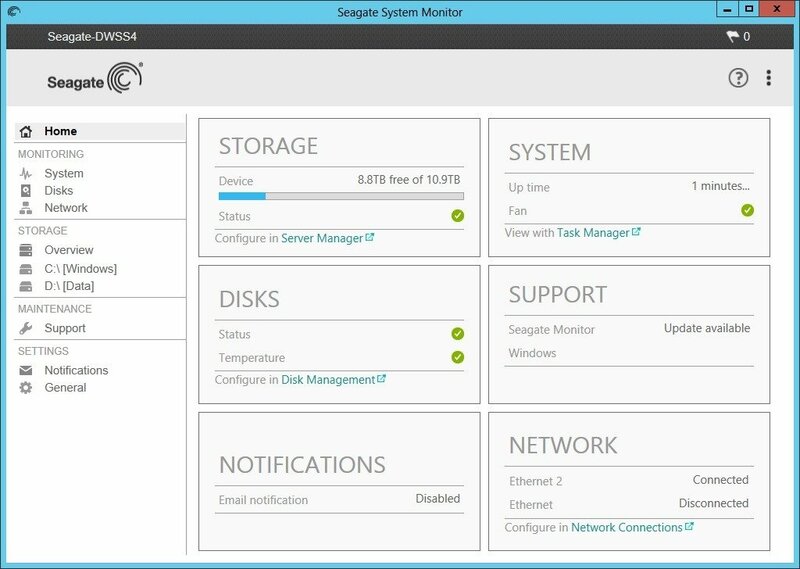 Seagate provide a System Monitor tool with greatly helps with the management of the NAS. The home screen is a quick view to all the major NAS functions, and can be a first stop when monitoring the NAS’ health. First in the Monitoring section is System. This confirms the processor and memory we have on board, and gives useful information about its usage, fan speed and temperature etc. 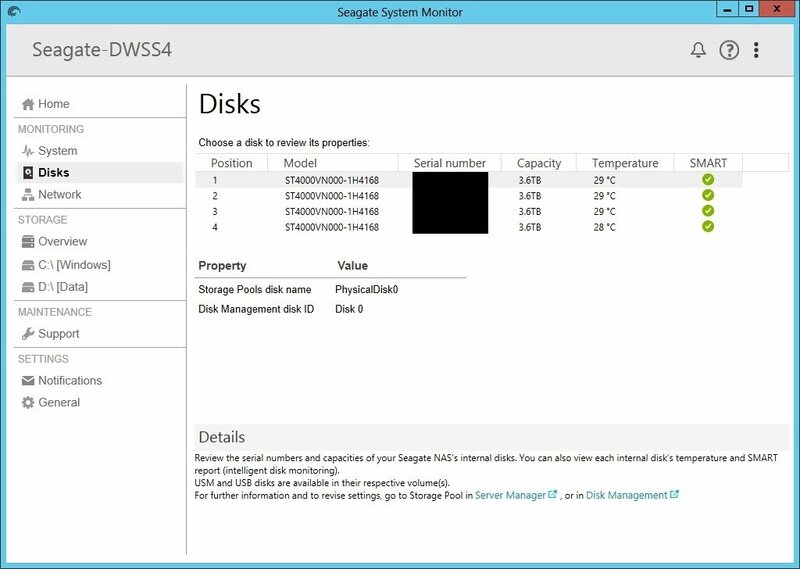 The Disks area is a bit more useful, giving details of the hard disk models, capacities and temperature. 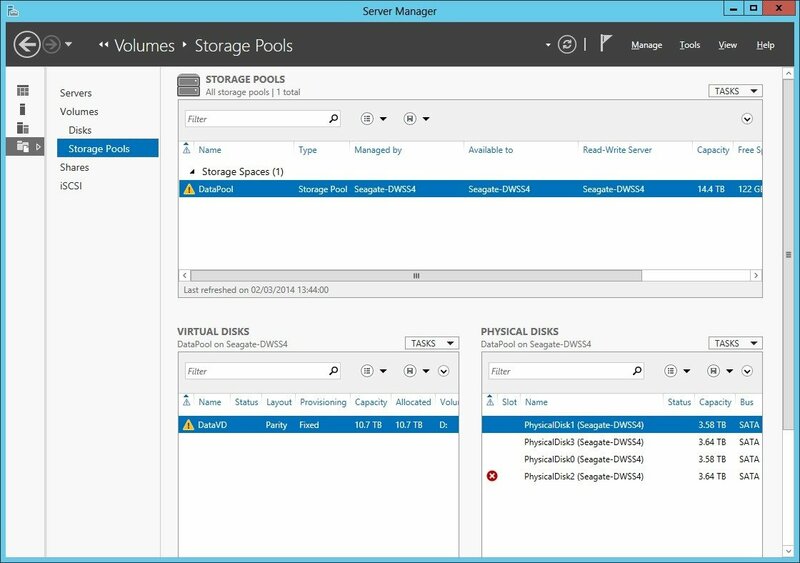 When a physical disk is selected, details of the Storage Pool usage is given beneath. Network gives connection specifics of the two Ethernet ports. As with the disks section, selecting the specific Ethernet port gives unique details for that port. The second picture shows how this screen changes if the NIC teaming is enabled on the two Ethernet ports. 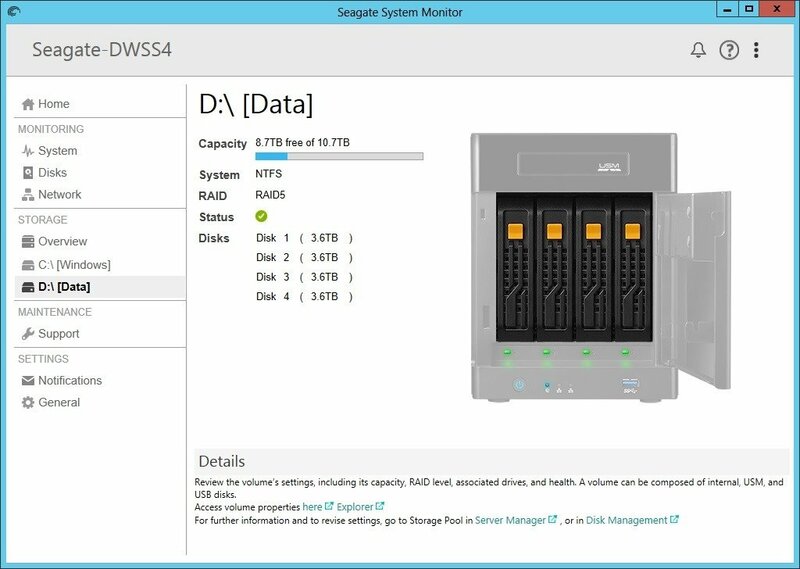 Dropping down to the Storage section, the Overview area gives details of all of the servers partitions, and which physical disks are included in the partition or storage group. If more details are needed, you are able to drill down into each of the partitions, and get a graphic representation of which of the servers drive bays holds that physical disk. As a test, the NAS was brought up with a drive removed to simulate a failed disk. If this was a real situation, it is very clear which of the drives is not working. 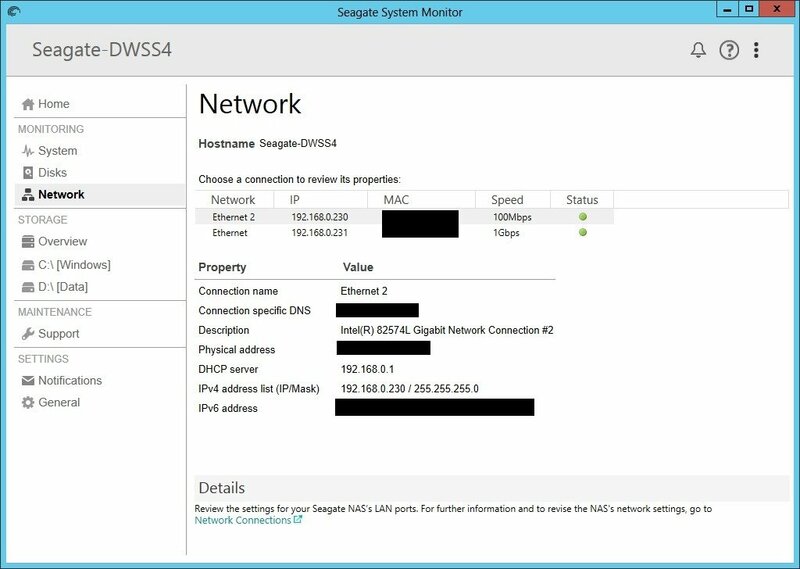 For greater control over the Storage Pool, you must leave the Seagate application, and use the familiar Windows Server Manager application. Here is the Server Managers view of the simulated disk failure. Because the array was created at RAID-5, there was no loss of service or data whilst the disk was removed. 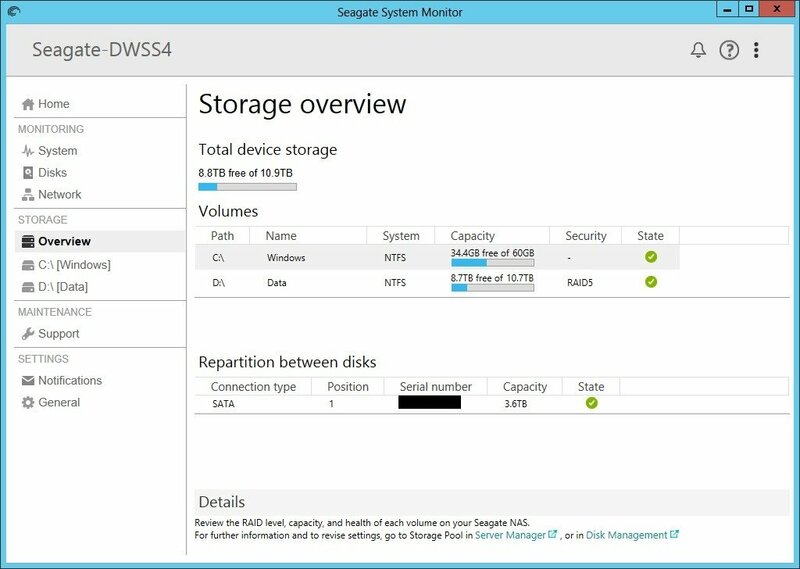 Out of the box, the NAS was configured using Windows Storage Pools in RAID-5. As there is no hardware RAID on this server, you are free to configure the Storage Pools however you want, or even simply use a JBOD configuration. The supplied hard disks are NAS optimised, so should be suited to the rigours of life in a small office environment. 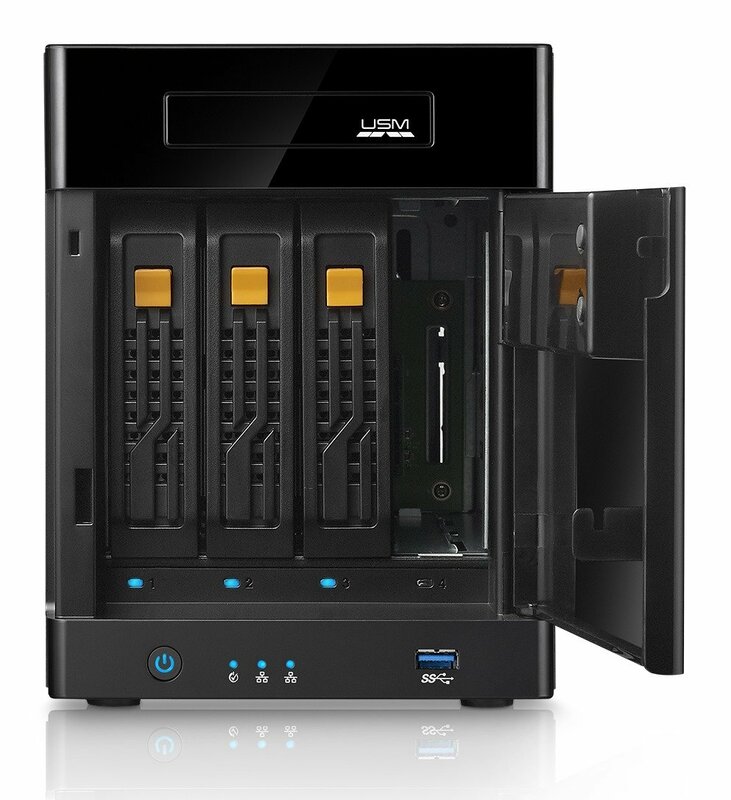 The inclusion of the USM slot is an interesting addition, and will find favour for anybody who needs a simple and elegant way of mobilising large volumes of data. This is a no nonsense business NAS, designed to increase the storage capacity of any small branch office which already uses a Windows domain. With plenty of RAM, adequate processor performance and NIC teaming on offer, basic file serving duties look to be no problem to it.